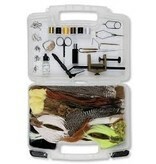 A great gift or the perfect starter fly-tying tool kit for any angler. 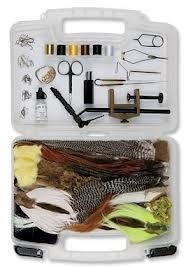 This all-inclusive kit contains the Orvis Fly-Tying Manual, a cam-action vise, scissors, whip finisher, hackle pliers, dubbing needle, bobbin, bobbin threader, and hair stacker. Materials include: assorted hooks, dubbings, threads, dry fly saddles, head cement, wires and tinsels, beads, dumbbell eyes, chenille, marabou, hare's mask, mottled turkey quills, Hungarian partridge, peacock herl, muskrat fur, deer tails, and Krystal Flash—essentially all the fly tying materials you'll need to tie the following 8 flies: Wooly bugger streamer, chartreuse/white Clouser minnow, Adams dry, emerging X-caddis dry, flashback, pheasant tail nymph, hare's ear nymph, Letort hopper, beadhead soft hackle nymph. Made in USA/imported.